The moment that 22 EXPLO Startup Entrepreneurship students step into the lobby of the Cambridge Innovation Center (CIC) in Boston’s famed Financial District, the energy shifts from a gentle hum to a feverish buzz. A combination of excitement and nerves hangs in the air while the students adjust their skirts and ties, scan their notecards, and prepare for the pitch of a lifetime. There are more than 400 entrepreneurs in the building living these students’ dream — and for some of them, this is the closest they’ve been to that dream being reality. 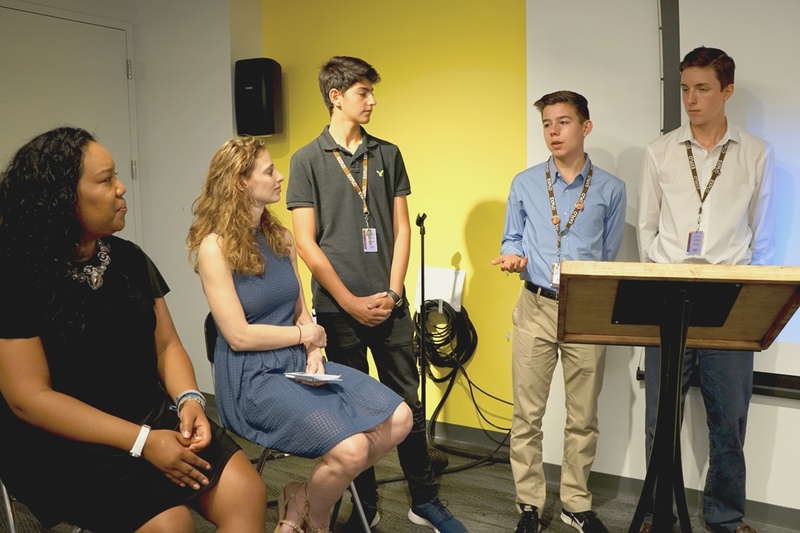 For two weeks each summer, a cohort of 13- to 15-year-old budding entrepreneurs from around the world convene on the campus of Wellesley College to get a jumpstart on building their startups. They begin by identifying a problem that they want to solve, conducting market research, developing a business model, and then plan a three-minute proof of idea pitch to present to a panel of Boston-based business people. Throughout the program, they visit innovation centers from Google and Greenhouse Labs to Level Up and MIT Launch. They hear from leaders in industry and business education, and apply what they’re learning and seeing each day to refine their plan presentations. With campuses in Cambridge, Boston, Ft. Lauderdale, and the Netherlands, Cambridge Innovation Center (CIC) is home to more startups than anywhere else on the planet. When Startup Entrepreneurship students visit CIC, they see firsthand the type of collaborative and creative environment that they will someday inhabit as professionals. From a Netflix competitor that would allow faraway friends to watch a movie together from their own homes, to a compassion-centered legal firm dedicated to defending the civil and human rights of America’s underserved and immigrant populations, to a fidget device that charges your mobile phone, students worked individually or in groups to create, practice, and execute their presentations. The feedback they received was meaningful and thought-provoking, requiring the students to think on their feet and answer questions about market competitors, brand differentiators, or what types of team members would be required to bring the idea to market. Alisha Harrington — a former defense attorney who now works with Impact Hub to provide resources, connections, collaboration, and inspiration to social entrepreneurs — says that this is the exact way students should be learning. “EXPLO is a great example of an education innovation company,” Harrington says. “I’m extremely passionate about education and I believe the whole EXPLO model is brilliant. School should be like this. It shouldn’t be an add-on.